I’ve always been very tactile in my wardrobe decisions, and it often trumps other factors, such as color or pattern, when making purchases. I don’t have a whole lot of flat cottons in my wardrobe for this very reason…I find them so boring. For example, I’d rather have a linen tee with a little texture than a cotton one. True to form, here’s an outfit from the weekend made (without realizing it) out of textures. 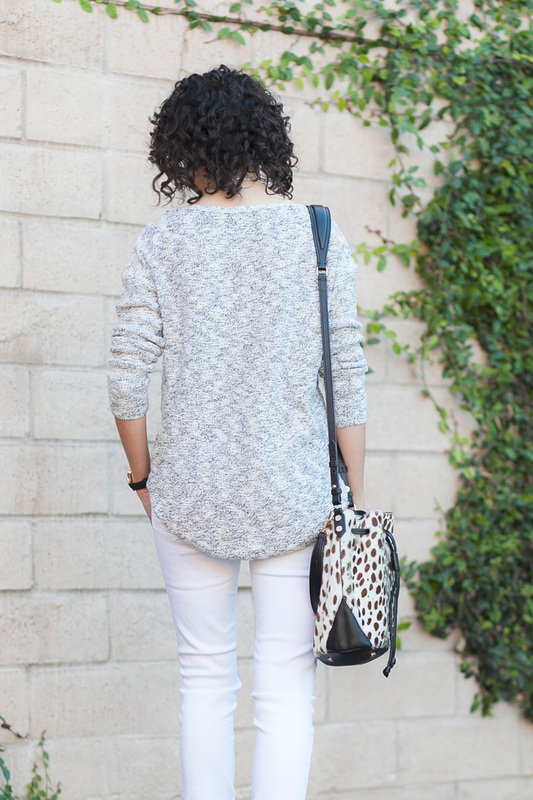 A nubby sweater, haircalf handbag, suede shoes, and even frayed knees on a pair of denim, all add their own unique texture to the mix. Bonus points…the frayed denim disguises my pointy knees, which like to poke out from the stretchy nature of most white denim. Similarly-sized readers may like to know for reference I’m wearing this sweater in size xxsp, which may be available in stores as a return, or even pop-back on the site at a later date, although this one is pretty much the same thing in shorter sleeves. Also, I sized up one size from my usual Rag & Bone size (23) in this pair of denim, since I liked the slightly looser fit in the leg of the 24. A simple, yet put together look. Thanks for sharing. I love your curls! Is that your natural hair? 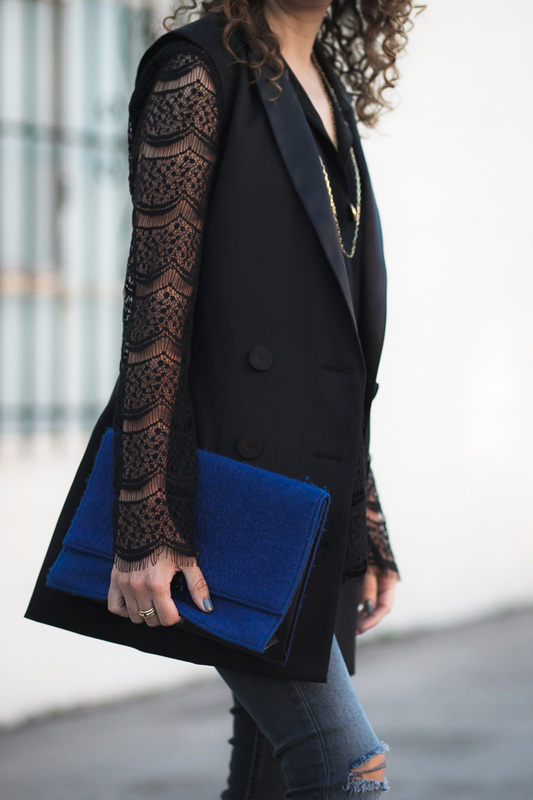 Adding textures into an outfit indeed make it more interesting! Love how you are able to do this in a minimalist chic way, thanks for the inspiration! OMG! That’s super similar! Thanks Cristina! You look fabulous today Kelly……this is one of my all time favourites on you….and I wear a very similar look. Soft grey is definitely a great colour on you!! I came to this blog because lately I’ve been wanting some petite inspiration, and you werer recommended. When I saw this post, I knew I’d love your blog! After browsing for a couple of hours, I thought I should comment something, so here it goes. Keep being awesome. I decided for this post, because as an Aspie, texture is a deal breaker. Since I was a kid, sometimes I just touch the fabric and it’s like sandpaper or something like that… it’s a horrible feeling.